A bagel (Yiddish בײגל) beygl) sometimes beigel, is a bread product traditionally made of yeasted wheat dough in the form of a roughly hand-sized ring which is first boiled in water and then baked. The result is a dense, chewy, doughy interior with a browned and sometimes crisp exterior. Bagels are often topped with seeds baked onto the outer crust with the most traditional being poppy or sesame seeds. Bagels are similar in shape to doughnuts and texture to bialys. Russian bubliks are very similar to bagels, but are somewhat bigger, have a wider hole, and are drier and chewier. Pretzels, especially the large soft ones, are also very much like bagels, the main exceptions being the shape and the alkaline water bath that makes the surface dark and glossy. The bagel has been regarded as a Jewish specialty, in part because its method of preparation made it popular among Jews as a convenient form of bread that could be baked without breaking the rule of no work on the Sabbath. Today the bagel is commonly eaten at breakfast, or as a snack or light lunch, often topped with cream cheese or smoked salmon (lox), giving rein to human creativity as new types of bagels and new toppings continue to appear. Still it retains its historical significance, representing Jewish Eastern European culture to many, while for others it is seen as quintessentially a product of New York City or simply the United States. Bagels with cream cheese and lox (cured salmon) (colloquially known as lox and a schmear). The bagel is a dense bread, raised with yeast, and containing almost no fat. At its most basic, traditional bagel dough contains wheat flour (without germ or bran), salt, water, and yeast leavening. Bread flour or other high gluten flours are preferred to create the firm and dense bagel shape and texture. Most bagel recipes call for the addition of a sweetener to the dough, often barley malt (syrup or crystals), honey, or sugar. Leavening can be accomplished using either a sourdough technique, or using commercially produced yeast. In more recent times, a variant of this process has emerged, producing what is sometimes called the steam bagel. To make a steam bagel, the process of boiling is skipped, and the bagels are instead baked in an oven equipped with a steam injection system. In commercial bagel production, the steam bagel process requires less labor, since bagels need only be directly handled once, at the shaping stage. Thereafter, the bagels need never be removed from their pans as they are refrigerated and then steam-baked. Bagels are often sold presliced, but other times they must be cut by the consumer. Improper cutting technique has led to many bagel-related lacerations. Mark Smith, head of George Washington University's Department of Emergency Medicine noted, "The bagel is inherently unstable because it's round. In fact there are two unstable surfaces: the knife against the bagel and the bagel against the table...I theorize that it's difficult to modulate the force needed to get through the exterior once you hit the doughy part, and you cut your finger." 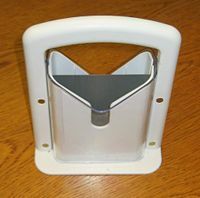 Due to such difficulty, devices have been specifically designed and produced for cutting bagels. The history of the bagel is unclear, but it appears to have been invented in Central Europe. The earliest mention of the bagel is in the 1610 statutes of the Jewish community of Krakow, Poland which state that it is permissible to make a gift of bagels to the woman who has given birth, the midwife, and the girls and women who were present. An oft-repeated story states that both the bagel and the croissant originated in 1683 in Vienna, Austria, when an Austrian baker created them to commemorate the victory in the Battle of Vienna over the Turks that sieged the city. Similar to the crescent-like croissant (Hörnchen in German, "little horn") which is said to have been inspired by the Turkish flag, the bagel is supposedly related to the victorious final cavalry charge led by King John III Sobieski of Poland. Thus, the baked good was fashioned in the form of a stirrup (German: Steigbügel, or the similar Bügel-shaped horseshoe). That the name originated from beugal (old spelling of Bügel, meaning bail/bow or bale) is considered plausible by many, both from the similarities of the word and because traditional handmade bagels are not perfectly circular but rather slightly stirrup-shaped. (This fact, however, may be due to the way the boiled bagels are pressed together on the baking sheet before baking.) Also, variants of the word beugal are used in Yiddish and Austrian German to refer to a round loaf of bread, or in southern German dialects (where beuge refers to a pile such as of wood). 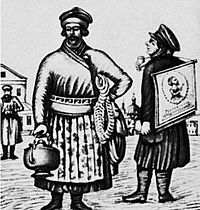 Others have suggested that the round hole in the center of the bagel allowed Russian and Polish bakers to carry many of them on a long pole as they walked the streets selling their fresh bread. Since the middle of the nineteenth century, bakeries on Brick Lane and the surrounding area in London have sold bagels (the local orthography is "beigel") which were often displayed in the windows of bakeries on vertical wooden rods of up to a meter in length. There was a tradition among many observant Jewish families to make bagels on Saturday evenings at the conclusion of the Sabbath. They were not permitted to cook during the Sabbath and, compared with other types of bread, bagels could be baked very quickly as soon as it ended. The preparation of the dough for bagels was done prior to the start of Sabbath, left to rise slowly, and was ready for cooking when Sabbath ended. Eastern European Jewish immigrants brought their skills as bagel makers to North America at the end of the nineteenth century. In the New York City area these bakers formed their own union, controlling baking methods and resisting automation. As these bakers, and their apprentices, moved out of the city they developed new ways of preparing and packaging their bagels, so that this highly perishable product could be distributed far beyond the bakery. The bagel came into more general use throughout North America in the last quarter of the twentieth century, at least partly due to the efforts of bagel baker Harry Lender, who pioneered the frozen bagel in the 1960s. Today, bagels are enjoyed all over the world, and have become one of the most popular breakfast foods. The two most prominent styles of traditional bagel in North America are the Montreal-style bagel and the New York-style bagel. Poppyseed (dark) and sesame seed (light) Montreal-style bagels. The Montreal bagel is a distinctive variety of hand-made and wood-fired baked bagel. Like the similarly shaped New York bagel (described above), they were brought to North America by Jewish immigrants from Eastern Europe; the difference in texture and taste reflects the style of the particular area in Eastern Europe in which the immigrant bakers had learned their trade. The bagel was introduced to Montreal by a baker named Isadore Shlafman in 1919. His descendants continue to make bagels today in the same neighborhood at the Fairmount Bagel Bakery. In many Montreal establishments bagels are still produced by hand and baked in wood-fired ovens, often in full view of the customers. However, the market for bagels is by no means restricted to the Jewish community, and bagels have become a part of the broader Montreal culture. 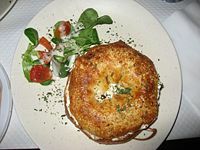 In contrast to the New York-style bagel, the Montreal bagel is smaller, sweeter, and denser, with a larger hole, and is always baked in a wood-fired oven. It contains malt, egg, and no salt, and is boiled in honey-sweetened water before being baked in a wood-fired oven, whose irregular flames give it a dappled light-and-dark surface color. There are two predominant varieties: black-seed (poppyseed), or white-seed (sesame seed). "Everything" bagel with a variety of seasonings. 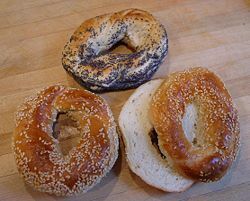 In addition to the plain bagel and the standard poppy or sesame seeds, variants feature different seasonings on the outside, including garlic, onion, caraway, and salt. The "everything" bagel is topped with a mixture of a large variety of toppings; the exact ingredients depend on the vendor. Poppy seeds, sesame seeds, onion flakes, caraway seeds, garlic flakes, pretzel salt, and pepper, are all popular toppings that most vendors use on an "everything" bagel. While normally and traditionally made of yeasted wheat, many variations on the bagel flourished in the late twentieth century. Non-traditional versions which change the dough recipe include pumpernickel, rye, sourdough, bran, whole wheat, and multigrain. Other variations change the flavor of the dough, often using salt, onion, garlic, egg, cinnamon, raisin, blueberry, chocolate chip, cheese, or some combination of the above. Green bagels are sometimes created for St. Patrick's Day. Breakfast bagels, a softer, sweeter variety usually sold in fruity or sweet flavors (such as cherry, strawberry, cheese, blueberry, cinnamon-raisin, chocolate chip, maple syrup, banana and nuts) are commonly sold by large supermarket chains; these are usually sold pre-sliced and are intended to be prepared in a toaster. 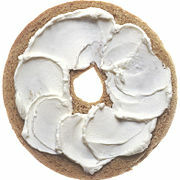 Half a bagel spread with cream cheese. Bagels are particularly popular as breakfast foods. They are often cut in half, toasted, and eaten spread simply with butter or a cream cheese topping. There are several different toppings that are popular on bagels. Bagels topped with cream cheese, lox (salt-cured salmon), tomato, and onion is a popular Jewish dish. 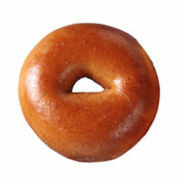 A bagel can also be substituted for two slices of bread. In London, bagels are often eaten as a sandwich filled with salt beef. Bagels are sometimes used as breakfast sandwiches, that are filled with eggs, cheese, ham, and other fillings. Pizza bagels are another popular way to prepare bagels, in which they are sliced, then topped with tomato sauce and cheese and then toasted or re-baked. In the context of Jewish culture, the process involved in making bagels provided the advantage that it could be followed without breaking the no-work rule of the Sabbath. The dough would be prepared on the day before, chilled during the day, and cooked and baked only after the end of the Sabbath, therefore using the Sabbath as a productive time in the bagel-making process (as the dough needs to slowly rise in a chilled environment for a time before cooking). After the Holocaust, American Jews came to identify the bagel with the Old World and with immigrant Jewish culture. Irving Pfefferblit declared that "the Jewish bagel stands out like a golden vision of the bygone days when life was better." 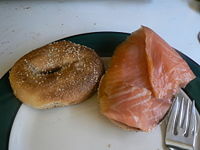 With the secondary migration of Jews to California and Florida during the postwar years, brunch with bagels and lox became "a Sunday morning ritual with its own equipage, including bagel slicers and decorative bagel platters with compartments for smoked salmon, cream cheese, butter, olives, radishes, and slices of onion and tomato." The bagel today is popular the world over, a platform for foods as diverse as the meanings and values it carries for those who eat them. For many Americans, the bagel represents Eastern European culture, for others it represents New York City, and for people around the world it is American. The bagel has become a popular bread product in the United States, Canada and the United Kingdom especially in cities with large Jewish populations, such as Chicago, New York City, Los Angeles, Montreal, Toronto and London, each with different ways of making it. Bagels in North America in the twenty-first century range in size from minibagels to huge, overstuffed party bagels. There is a square bagel. There are almost unlimited flavors (from cranberry granola to piña colada), toppings (everything from poppy seeds, sesame seeds, caraway seeds, and garlic to streusel), and fillings (from cream cheese to bacon and eggs). At bagel shops offering numerous types of bagels, and even more varieties of spreads and fillings, customers can create hundreds of combinations. The traditional London bagel (or "beigel" as it is called) is harder than the North American varieties, and has a coarser texture with air bubbles. 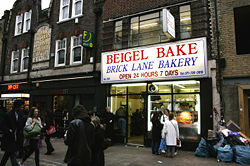 There are two long established "beigel" shops on Brick Lane in East London. The Uyghurs of Xinjiang, China enjoy a form of bagel known as girdeh nan (from Persian, meaning round bread) , which is one of several types of nan, the bread eaten in Xinjiang. It is uncertain if the Uyghur version of the bagel was developed independently of Europe or was the actual origin of the bagels that appeared in Central Europe. In Turkey, a salty and fattier form is called açma. The ring-shaped simit is sometimes marketed as a Turkish bagel. In some parts of Austria, ring-shaped pastries called Beugel are sold in the weeks before Easter. Like a bagel, the yeasted wheat dough, usually flavored with caraway, is boiled before baking, however, the Beugel is crispy and can be stored for weeks. Traditionally it has to be torn apart by two individuals before eating. In Russia, Belarus and Ukraine, the bublik is essentially a very enlarged bagel. Other ring-shaped pastries known among East Slavs are baranki (smaller and drier) and sushki (even smaller and drier). 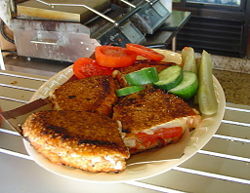 A typical Bagel Toast served with tomatoes, pickles, and cucumber. The sandwich press toasters are in the background. Bagel toast (Hebrew: בייגל טוסט) is a modern Israeli snack composed of a very large, toasted bagel filled with cheeses and vegetables, and grilled on a Sandwich toaster. The "bagel" is not a New York style bagel. It is round with a hole in it, hence the name, but made from a completely different dough with sesame seeds. Bagel toast is commonly filled with white, yellow, or feta cheese, green olives, corn, tomatoes, and pizza sauce, or a spicy sauce. Bagel toast can be found at many coffee houses in Israel and is also popular at snack bars at community centers, public pools, and is also served as a casual snack in the home. ↑ Peter Reinhart, The Bread Baker's Apprentice (Ten Speed Press, 2001). ↑ Cindy Loose, "Experiencing a Slice of Bagel Life: The Less Adept Find the Cutting Edge of a Round Bun," Washington Post (1995). ↑ Mordecai Kosover, Yidishe maykholim: A shtudye in kulturgeshikhte un shprakh-forshung (New York: YIVO, 1958). ↑ Irving Pfefferblit, "The Bagel," Commentary 7 (1951): 475–479. ↑ Barbara Kirshenblatt-Gimblett, Bagel, Food & Culture Encyclopedia (2008). Retrieved June 17, 2008. ↑ Simpletoremember.com, World Jewish Population, Analysis by City (2001). Retrieved June 25, 2008. Bryk, Nancy E. V. How is a bagel made? answers.com. 2008. Retrieved June 17, 2008. Kirshenblatt-Gimblett, Barbara. Bagel Food & Culture Encyclopedia, 2008. Retrieved June 17, 2008. Kosover, Mordecai. Yidishe maykholim: A shtudye in kulturgeshikhte un shprakh-forshung. New York, NY: YIVO, 1958. This page was last modified on 9 December 2016, at 00:06.